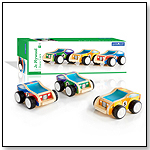 Cubebot is a range of playful wooden robot puzzles that challenges and inspires children and adults alike. 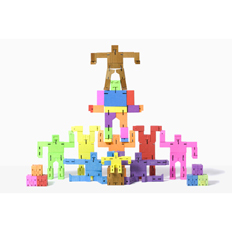 Available in an assortment of shapes, sizes and colors, each Cubebot holds dozens of poses. After playtime, Cubebot offers the challenge of trying to fold it back into its perfect cube. Robot toys are usually made of plastic and require batteries - but not Cubebot! Cubebot is made from new growth beech wood and is powered by imagination. Inspired by the Japanese Shinto Kumi-ki puzzles, Cubebot combines ancient Japanese traditions with contemporary toy culture. It is an enduring classic that will withstand generations of play. Available in Extra Large, Medium, Small, Micro, as well as a choice of finishes: Natural, Blue, Green, Multi, Orange, Pink, Red, Violet and Yellow. Recommended for ages 3+.